Happy Friday!! It's the first weekend of the school year and we have a quiet one planned! I love how serious A looks on her first day of school. Things are going swimmingly well (i don't believe I've ever used the phrase 'swimmingly well' before but I love it). She hasn't cried once.... I'm very surprised as C cried on her second and third day of her toddler program. Heck, up to last year C cried on her second day... but nothing! And great reports from her teachers, (who I love). They say she is chatting up a storm and everyday when she gets in the car, she informs me that she had fun! 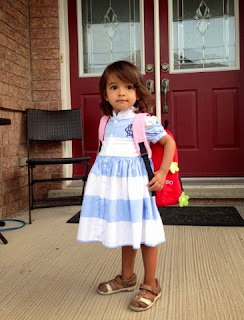 If you missed my first day of school post, here is it. 2- Favourite upkeep of promises. I made fish tacos for the first time this week and they were A-MAZ-ING. With fresh coleslaw, avocado, chopped red onions and cilantro, this meal will definitely be added to the rotation. We've been getting some fantastic hot weather. Enough for the kids to get to the park, get some more use out of their summer dresses and for us to just enjoy just a bit more summer fun. Now that school has started again, the tv is off once again for C during the week. We did this last year as well and it was such a success! I was scared to begin it initially but the girls play so much more and do so much other stuff. I do watch a little at night when they're asleep including some of the finale of SYTYCD. It was one of C's and my favourite shows this summer and I felt so guilty watching it without her so I've recored it to watch the whole thing with her. I do know who won though. It's impossible not to these days but I totally think Ricky deserved it. My favourite of all time is still Chehon though. Hope everyone has a wonderful weekend and it goes swimmingly well... haha! She is so adorable! Good for her for not crying! No spend September is such a great idea! The holidays get so expensive, it would be so nice to have that extra cushion! Such a cute pic! And yum, fish tacos. One of my favorite summer meals! What an adorable little lady on her first day! She looks so cute in her dress. Glad school is going well so far!! Glad to hear No Spend September is going well for you! Instead of a no spend month, I try to implement one no spend week each month...sadly, I haven't been too successful yet, but I keep trying! Mother's anxiety, toddler happy and enjoying her three hours of socialization, in a few days she seems to have matured a few months. Your daughter is so beautiful! :) What a tough girl for not crying!! I love your blog!